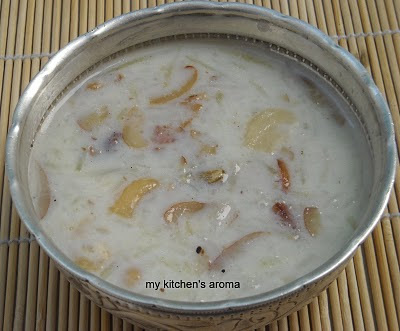 I saw this recipe of kadhu ki kheer at zaiqa long back and it is very easy to make with very few ingredients.I made this on the sankranthi. Fry all the dry fruits in the ghee and keep aside. Heat milk in a thick bottom vessel.Let it boil for 5-6 minutes. Then add grated bottle gourd,sugar and all the dry fruits. Keep the flame in simmer and let it boil for another 5 minutes. Kheer looks soo creamy and delicious.. Bottle gourd kheer looks delicious. Thanks for visiting my blog. You have nice space, following you. Thanks for stopping by my blog and for your lovely comments! I'm hosting an event called Kerala Kitchen on my blog featuring dishes inspired by Kerala and would love to have you over! Kheer looks delicious. This is my favourite . this is very new for me, looks delish!